This 6-bedroom villa for up to 12 guests is located in Plovanija and has a private swimming pool. Plovanija 4 km from Buje: Beautiful single-family house Irena, 2 storeys. 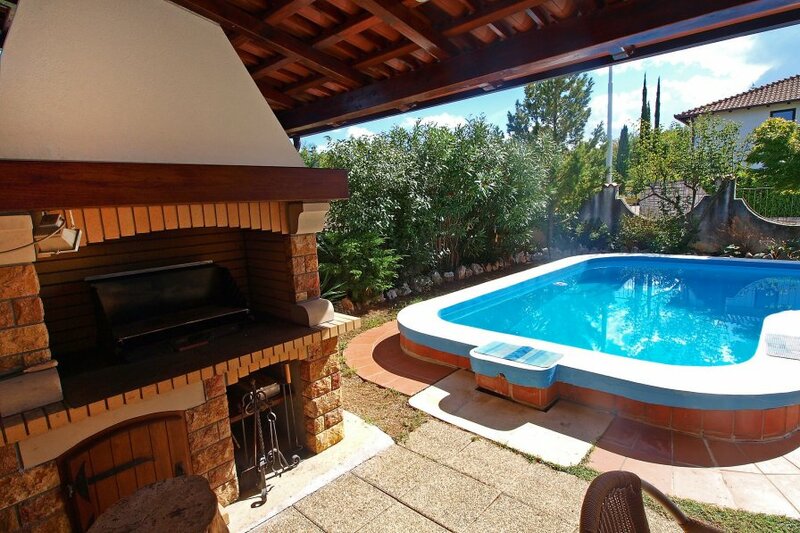 12 km from the centre of Umag, in a quiet position, 4 km from the sea, in the countryside. Private: property 500 m2 (fenced), garden with lawn and trees, swimming pool (38 m2, depth 90 - 180 cm, 12.05.-08.09.). Outdoor shower, terrace (40 m2), garden furniture, barbecue house. In the house: internet access, sauna, fitness room, washing machine. Parking at the house on the premises. Shop, restaurant 500 m, shingle beach 4 km, rocky beach 4 km. Tennis 4 km, walking paths from the house 100 m, cycle lane 150 m. Please note: the owner lives on the same property. By groups of young people double deposit is requested on arrival. 9-room house 185 m2 on 2 levels. Living/dining room with open-hearth fireplace, satellite TV and air conditioning. Exit to the terrace, to the veranda. 1 room with 1 french bed (200 cm, length 200 cm). Small living room with kitchen corner, satellite TV and air conditioning. 1 room with 1 french bed (180 cm, length 200 cm). Exit to the balcony. 1 room with 1 french bed (180 cm, length 200 cm), satellite TV and air conditioning. 1 room with 1 french bed (180 cm, length 200 cm). Open kitchen (4 hot plates, oven, dishwasher, microwave, freezer). Bath/bidet/WC, shower/WC, bath/shower/bidet/WC. Top floor: (spiral staircase) living/dining room with satellite TV and air conditioning. 2 rooms, each room with 1 french bed (180 cm, length 200 cm). Open kitchen (4 hot plates, oven, dishwasher, freezer). Shower/bidet/WC. Balcony 13 m2, terrace 30 m2 partly roofed. Terrace furniture. View of the swimming pool and the garden. Facilities: baby cot (extra). Internet (WiFi, free). 1 pet/ dog allowed.